Timothy is a global health and environmental specialist at the World Bank Group. He founded and currently leads the climate and health portfolio, working across sector and region. He also works on lending programs that address ocean and fisheries science, one health, environmental health, infectious disease, satellite remote sensing and earth observation, data science and (non-health dimensions of) climate change. Trained as a medical doctor and environmental scientist, he has in recent years worked to develop the Global Partnership for Oceans, with the Nuclear and Radiation Studies Board of the US National Academy of Sciences, with the World Health Organization’s climate change and health cluster, and in health systems in India and Rwanda. He holds degrees in biology, bioethics, geography, and medicine from Tufts, Harvard, Oxford, and Duke. 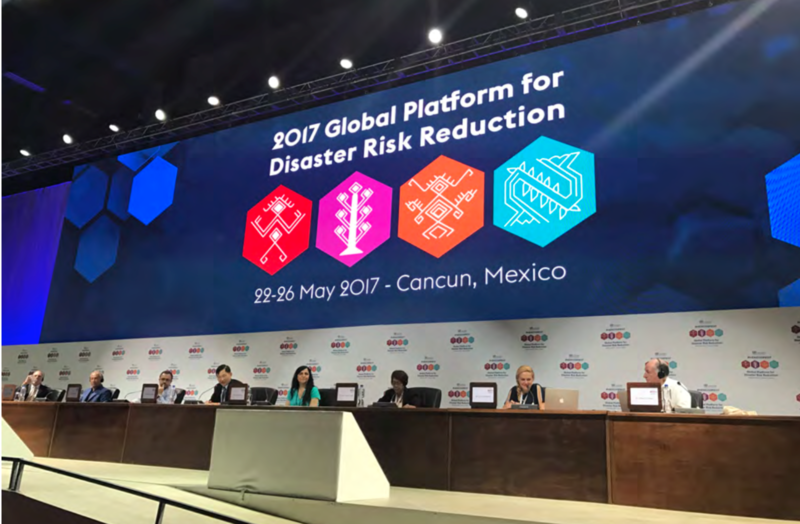 The Global Platform for Disaster Risk Reduction (DRR) held on 22-26 May 2017, a biennial event that brings together governmental, intergovernmental, private sector and technical communities toward action and implementation of the Sendai Framework. Health, unsurprisingly, is a key feature, both in terms of disaster impact and in building disaster resilience. The first Sendai target sets out to reduce global disaster mortality, the second target aims to reduce the number of affected people, the fourth aims to reduce damage to health infrastructure and disruption of services, and one of the framework’s four priorities includes investing in health resilience. Environment is also featured throughout in the context of understanding risk, building resilience, and loss of natural assets. Over the course of the week there were more than a dozen events that addressed health or climate and environment. These included sessions toward implementing relevant strategies in the Sendai Framework and others that addressed discrete dimensions of health or environmental considerations in DRR, like integrating health into DRR, through the adoption and implementation of the Bangkok Principles, preventing pandemics, building smarter hospitals, or integrating ecosystem-based solutions in climate adaptation and disaster risk reduction. In some sessions, environment and health were linked, drawing attention to causality, shared impact, and the value of developing systems that focus on environmental interventions to safeguard health. The connections between human health, environment, and climate are well established and are sometimes even included in international frameworks and conventions. For example, health was formally included in the Paris Climate Agreement of 2016. The UN Convention on Biological Diversity formally established a joint work program on biodiversity and health with the World Health Organization in 2012 leading to two comprehensive decisions on biodiversity and health in 2014 and 2016. The World Health Assembly presented a resolution on climate change and health in 2008. And the Montreal Protocol to protect the ozone layer (and human health) came into effect in 1989. Health is affected by environmental and social determinants in a number of ways. When healthy natural environments and ecosystems are disrupted, many people, particularly the poor and vulnerable, get sick and die: air pollution leads to 7 million annual deaths from cardiovascular and respiratory disease and skin cancer skyrocketed under a depleted ozone layer; disrupted animals and ecosystems can lead to infectious disease- 60% of all human infectious pathogens come from animals (zoonotic diseases), including killers like HIV, Ebola, and highly pathogenic avian influenza; and malnutrition and starvation following from weather shocks have resulted in the deaths of countless millions over generations. When the environment is thriving and in good stewardship, health benefits are often clear: there are ample nutritional resources to sustain human populations; medicines can be derived from plants and animals (as has been true with indigenous populations, but also Western ones – HIV medication, cancer treatments, pain medication and thousands of others are derived from biological resources); and we are protected from storms, floods, and mudslides by vegetation and tree-cover. At a health systems level, recognizing these connections is also important because hospitals and care facilities must be built to function in the face of extreme weather and disaster and measures must be in place to reduce human and ecological vulnerability and exposure. In an era of new climate realities, population growth, and increases in trade and travel (i.e. disease spread), environmentally related disasters are bound to increase. Health systems must be prepared. This means (i) building in locations that will not be overcome by floods or storms, (ii) establishing supply chains that are resilient to global environmental shifts, (iii) anticipating increases in certain types of disease outbreak and spread, and (iv) training staff to recognize and respond to these risks. There are available resources in place and experts coming together to develop tools to help us prepare for and prevent worst outcomes. The World Bank, for example, has a number of initiatives working at this interface. This includes a Recovery Hub, an on-line portal that provides resources for different sectors, including health, in disaster response and recovery. The World Bank have just released Climate-smart healthcare: low carbon and resilience strategies for the health sector, a guidebook for building cost-effective, sustainable, and efficient health systems of the future. The Bank also have established the Pandemic Emergency Financing Facility that provides both cash and insurance to countries to help them with emerging disease threats and are integrating pandemic considerations into universal health coverage through a new joint initiative with Japan. The World Bank Group is not working alone. Partnership on this topic is critical and we are in constant dialogue with partners in the UN, governments, academia, and civil society. For example, with EcoHealth Alliance, an NGO and international leader in connecting environment and health for on-the-ground action, we are developing an Operational Framework for Strengthening Human, Animal, and Environmental Public Health Systems. With the UN Convention on Biological Diversity we are exploring new avenues of collaboration under their joint work program with the World Health Organization and within their newly-established Interagency Liaison Group on Biodiversity and Health. And with the UN Office for Disaster Risk Reduction we are working to develop novel post-disaster recovery guidance for the health sector. Recognizing the connections between health, environment, climate, ecosystems and disasters is important because it enables better planning, preparedness and response; reduces human and ecological vulnerability; establishes coalitions amongst partners with common interests; and reduces risks to humans and the ecosystems upon which we depend for our good health. Collective action simply makes sense and will help us better achieve our common aims of safeguarding people and the planet. Field visit of the Amerimed Hospital located in Cancun. The hospital has implemented resiliency strategies under the Safe Hospital Programme, taking into account all hazards. Click the link "Economic Impact of Selected Infectious Disease Outbreak (Full graph)" below to view the full graph. CONTENT IS DISPLAYED AS LAST POSTED BY A PREVENTIONWEB COMMUNITY MEMBER OR EDITOR. THE VIEWS EXPRESSED THEREIN ARE NOT NECESSARILY THOSE OF UNISDR PREVENTIONWEB, OR ITS SPONSORS.